The stability and ruggedness of modern NTC thermistors place them in a category that is equal to or superior to Standard Platinum Resistance Thermometers (SPRT’S) and Platinum Resistance Thermometer (PRT’S) as a calibration standard. This is particularly true due to the thermistors ability to withstand physical shocks associated with every day handling. And, it is also true of the electrical characteristics with the thermistor exhibiting low annual drift and very high resistance change per degree. U.S. Sensor has conducted studies with similar results to studies performed by NIST (National Institute of Standards and Technology) that show thermistors can be produced with typical drift of only 0.001°C to 0.002°C per year. 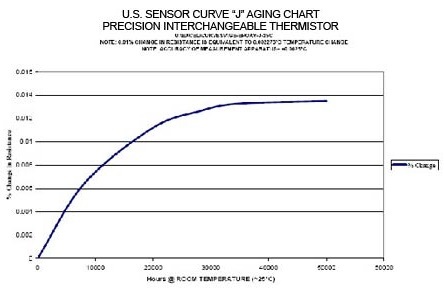 While Stability is a measure of a thermistors ability to retain specified characteristics after being subjected to [typical] environmental or electrical stresses, Long Term Aging is the effect of exposing the thermistor to harsh electrical or environmental conditions over long periods of time. 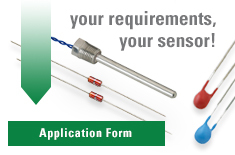 U.S. Sensor Corp. subjects its high accuracy thermistors to a special Long Term Aging Process to minimize long term drift. This process provides the customer with a stable, reliable, and rugged calibration standard for use in the –40° to 150°C temperature range.